I got a great deal on a mil-spec UTG Pro 6-position collapsible stock, and buffer tube assembly. My initial thinking was that it would be "suitable" at least until I decided on one of the more 'robust' options, but when it arrived I found it of impressive quality (AND made in the USA). Right now, I think I'll keep it. To install the stock, I needed an M4 stock wrench. Several phone calls later and after dropping by 'Cheaper than Dirt' (CTD) first, I found none available and all on 'backorder'. I was also looking for some spare piece parts, and those were unavailable at CTD at the moment as well. The catalog desk rep at CTD recommended I order the parts through Rock River Arms - and it was a good tip. I ordered the parts AND the wrench at what were the lowest prices that I'd seen (wrench was 6 bucks!) and the shipping via USPS was trivial. The magazine is a Magpul 5.56 20 Rd, picked up at the Carswell JRB BX gun shop (no sales tax). 1) 16" or 20" stainless steel bull barrel? A DT/Military.com rep has contacted me: they're doing what they can. The person responsible for managing the 'back-end' of the Military.com blogs is aware of the troll who has posed as me and is making sue DT is doing what it can to contain the outbreak'. I don't want to mention details because that could be counterproductive. I know they're only able to do so much and I know what their limitations are. I also understand that they can't provide me with the little troll's e-mail and IP address, but I still wish they could - as I have access to certain...ahem,,,'technical' capabilities that I wouldn't mind employing in a just cause. The 'troll factor' was a minor contributor to my getting out of a side web-design business I had in the 90's [main reasons being 1) the unreasonableness of small business demands for the $: the smaller the business, the more unreasonable the demands, and 2) getting stiffed by the same small businesses]. So while the troll with no life is trying to smear my good name, I'm on vacation and was again out at my Brother's ranch yesterday and today (got back tonight). Last night, the 'local girls' were out early. 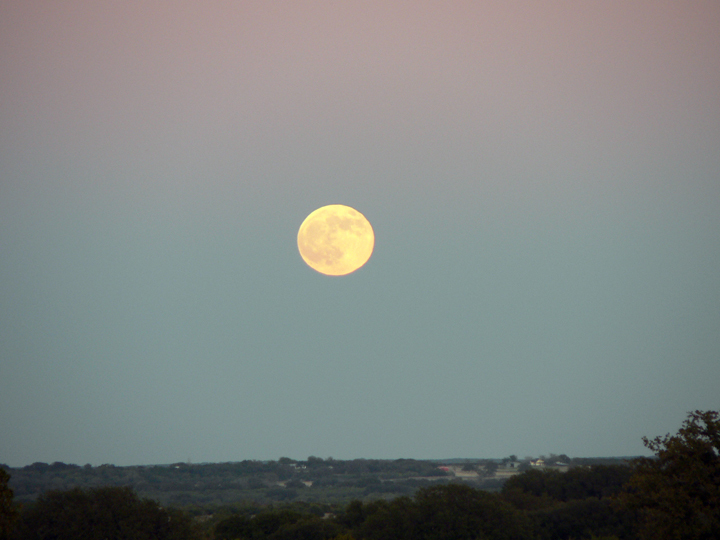 It was a cloudless, gorgeous evening last night (tonight we had high clouds). Tonight, the two older doe were out so early that there was only a few feet of shadow on the oat field, and I had to move the two early birds off just to get to my stand. They came back later with three friends and moved down the field in front of me. 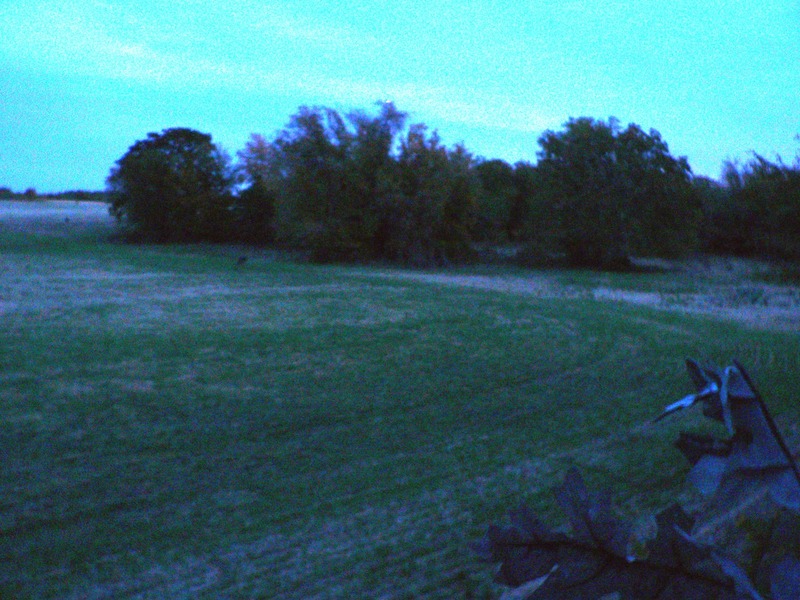 I kept watching the top of the field and pretty soon (almost too dark) a nice buck came out. He scraped the ground and ran his antlers into some low branches and proceeded to move towards my position almost on a bee line. He's that spot at the top of the field (sorry about the poor quality, but it was so dark I had the camera on 'aperature priority' and had to snap a quick one so I could have my rifle ready before he got too close.). 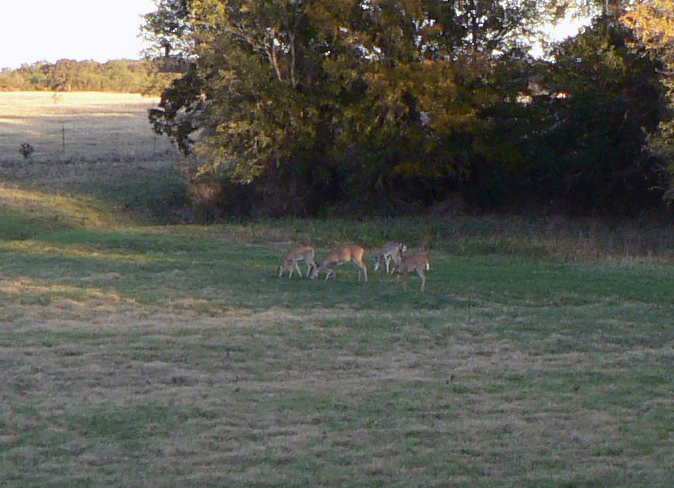 He veered straight down the field towards the doe such that his line took him even to my position. 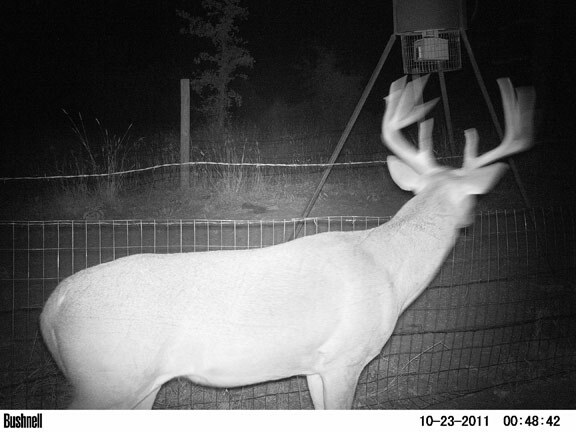 As he approached, I decided he was the same pretty boy I saw last Saturday night pacing a doe in the same place, only tonight I could ID him as the non-typical 10-point (Eastern count) that has been showing up on my Brother's game cameras. He looks like an 'eight' but he has nice little double brow tines. 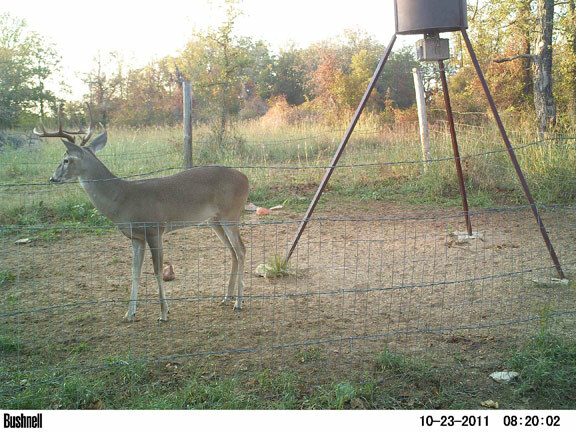 Nice buck, but next year (if he makes it) he might be a 'great' buck --his peak is yet to come. This guy worked his way down in front of me no more than thirty yards out. About the time he pulled even the wind from behind me picked up, and he caught some of my scent. He couldn't locate me, but he knew he didn't like me very much and after giving me a left view, a front view, and a right view, he decided to pull out fast - back to whence he came. It was a great show tonight. Thanks Brother B!